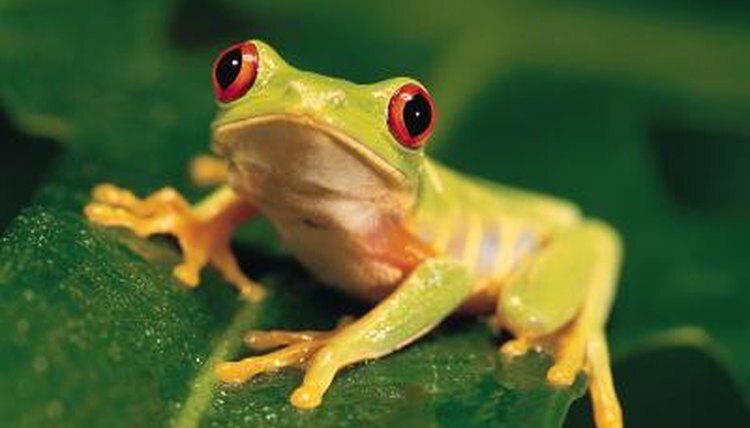 It’s estimated that Madagascar has more than 300 species of frogs, including the lemon spotted frog. The lemon spotted frog is a type of Heterixalus punctatus, a frog species that makes its home across Madagascar’s rain forest belt, in the area’s subtropical and moist lowlands. Madagascar’s lemon spotted frog eats invertebrates, or animals without backbones, like arthropods. Arthropods are invertebrates with exoskeletons, like insects, spiders and crustaceans. Because the lemon spotted frog makes his home in rain forest trees, he does not feed on crustaceans. Lemon spotted frogs prefer their dinner moving, so they’ll go for live spiders, like the tree-based afrarchaea, rather than dead ones.